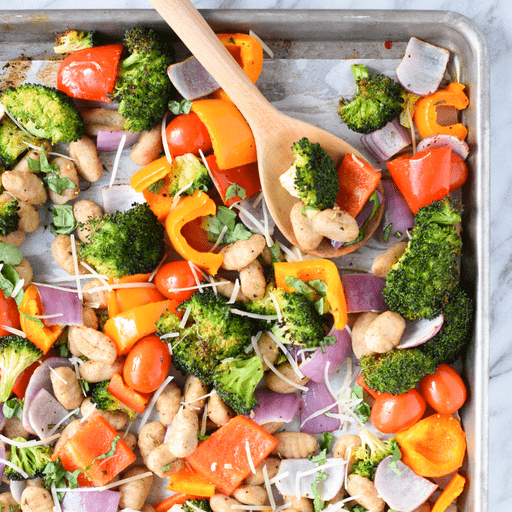 Delicious, browned gnocchi and caramelized veggies combine in an easy sheet pan meal that the whole family will love. 1. Preheat oven to 450°F. Line a rimmed baking sheet with parchment paper. 1. Place the gnocchi, peppers, tomatoes, onion, garlic, rosemary, salt and black pepper in a large bowl. Drizzle with oil and gently toss to combine. Spread the gnocchi mixture evenly onto prepared baking sheet. 1. Roast, stirring halfway through, until the gnocchi are plump and the vegetables are tender and caramelized, about 18-20 minutes. 1. To serve, spoon the gnocchi and vegetable mixture into individual bowls and garnish each bowl with basil and shredded cheese, if desired. For dairy free: Omit Parmesan or use a dairy free cheese to garnish. Per Serving: Calories 310, Total Fat 17g (Saturated 6g, Trans 0g), Cholesterol 45mg, Sodium 410mg, Total Carbohydrate 36g (Dietary Fiber 3g, Total Sugars 12g, Includes 0g Added Sugars), Protein 7g, Vitamin D 0%, Calcium 6%, Iron 10%, Potassium 10% *Nutritional values are an approximation. Actual nutritional values may vary due to preparation techniques, variations related to suppliers, regional and seasonal differences, or rounding.